What is the CHISQ.INV Function? The CHISQ.INV Function is categorized under Statistical functionFunctionsList of the most important Excel functions for financial analysts. This cheat sheet covers 100s of functions that are critical to know as an Excel analysts. It will calculate the inverse of the left-tailed probability of the chi-square distribution. In financial analysisFinancial Analyst Job DescriptionSee a real Financial Analyst Job Description including all the skills, experience, and education required to be the successful candidate for the job. Perform financial forecasting, reporting, and operational metrics tracking, analyze financial data, create financial models, the function can be useful in finding out the variations in assumptions made. For example, we use a precision machine that produces balls for a high-quality ball bearing with a diameter of precisely 2000 μm (2 mm). Assuming that the machines generally produce balls of that size on average mean, but individual balls can vary slightly in either direction following a normal distribution. Depending on production conditions such as the raw material supplied, humidity factor, etc., production will vary that some machines produce balls distributed around the target of 3000 μm, while others produce balls with a wider distribution. Therefore, the variance parameter of the normal distribution of the ball sizes varies from machine to machine. Using CHISQ, we can model the variance of a particular machine. Probability (required argument) – It is the probability associated with the chi-squared distribution. 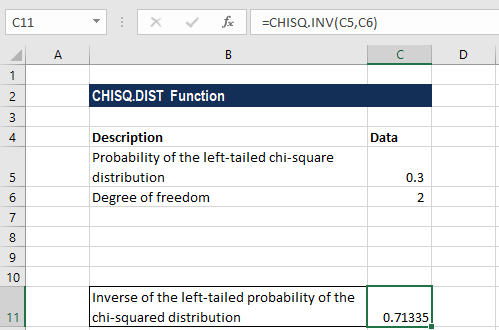 How to use the CHISQ.INV Function in Excel? So, the inverse of the left-tailed probability of the chi-squared distribution is 0.71335. If the argument deg_freedom is not an integer, it is truncated by MS Excel. #VALUE! error – Occurs when any of the arguments provided is non-numeric, that is, MS Excel is unable to recognize them as numerical values. The probability value is less than zero or greater than or is equal to one. The degrees_freedom argument is less than 1 or greater than 1010. 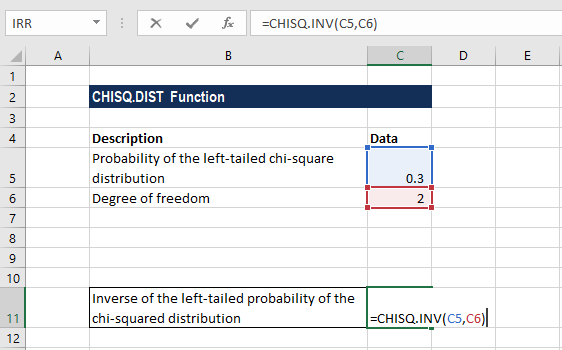 The CHISQ.INV function was introduced in Excel 2010 and hence is unavailable in earlier versions. CFI is the official provider of the FMVA Financial Modeling CertificationFMVA™ CertificationThe Financial Modeling & Valueation Analyst (FMVA)™ accreditation is a global standard for financial analysts that covers finance, accounting, financial modeling, valuation, budgeting, forecasting, presentations, and strategy. , designed to transform anyone into a world-class financial analyst.